Hello everyone. I have a Tsukayu Batwing Fairing with a Nakamichi 4 channel amp (NGMD60.4) and 2 6x9 Polk Audio speakers (MM692). I am trying to figure out what is the best wiring for these 2 speakers. I only plan on having 2 speakers. According to the amp specs it appears to be stable at 2 ohms so option 1 will yield the most output since a mono feed will drive the speakers at 2 ohms. Since the speakers are not more than 3 feet apart in the fairing you will not be affected by mono vs stereo output. A local friend said the same thing. This is how I have it wired right now. What I don’t understand, is why? 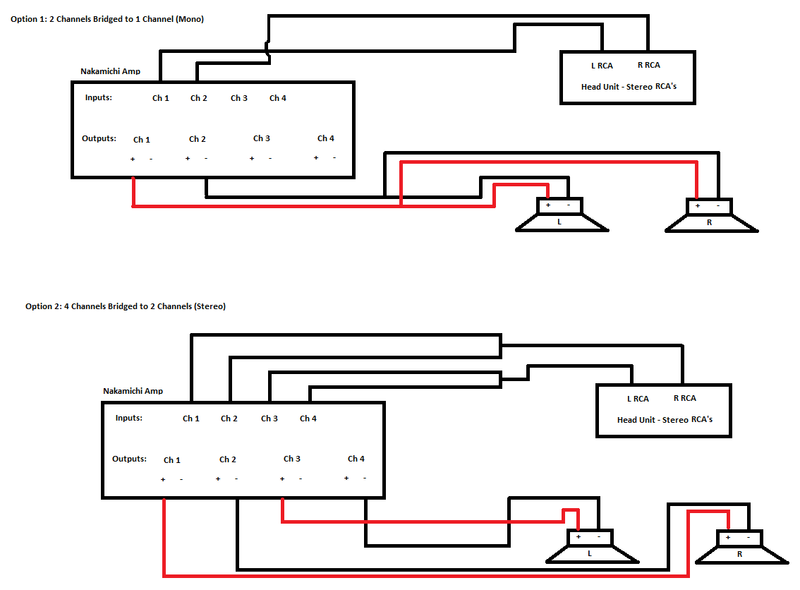 Why would there be more power only using 2 channels to bridge 2 speakers vs. 4 channels with 2 separate bridges. Don’t the amps just send equal watts to each channel, so wont I only be pushing 2 channels worth of watts to two speakers? Or is it because the ohms go down when bridging 2 speakers? I just don’t like not understanding this. It is because running the speakers parallel cuts the Ohms to 2. Ohms is a measure of resistance so the lower the number the lower the resistance. If the amp isn’t stable at that load, you would not be able to wire it in this configuration without damaging it. In order to run a mono load on an amp only stable at 4 ohms, you could either use a single 4 ohm speaker or two 2 ohm speakers in series to achieve a 4 ohm load. Parallel speakers means the + from the amp hooks to both + terminals on the speakers. Same for the - terminals. Running speakers in series means the + from the amp connects to the + of the first speaker, the - terminal from the first speaker connects to the + terminal on the second speaker and the - terminal on the second speaker connects to the - output of the amp. The bridging of channels is done electronically to give you more options with the amp, but ultimately is dependent on how you are wiring it up to the output. Hopefully that answers some questions for you. The amp is 2 ohm stable per channel. However when bridged it is only 4 ohm stable per "bridge". If you use option 1 you would be placing a 2 ohm load across channel 1 and 2, which would not be stable . I think your best option is using option 2 because you will have a 4 ohm load bridged over 2 channels (4 ohm stable). Each of your speakers is 4 ohm which would produce the 180w x2 @ 4ohm rating. Just some general information and a disclaimer that all numbers are approximate, the bike has a 360 watt rated stator and a 30 amp main fuse, 12 volts x 30 amps = 360 watts, wiring and regulated output are designed to match. A stock bike requires about 250 watts to run. Then theoretically there is about 110 watts in reserve or excess. If you measure your bike voltage at higher rpms you should see about 13.8-14.2V at the battery as this is what is required to maintain a healthy battery, a battery maintainer outputs about 14.5V. As you consume the excess 110 watts the regulator output will begin to drop in voltage, load current will be rising so voltage will be dropping to compensate. You have a set limited supply of power (watts) so as amp demand increases the output voltage will decrease. Most of the aftermarket voltage monitors will go yellow at 12.5V. Any lower than this and you risk not getting started if you stop. I built a charging system tester that monitors the output voltage and load in amps (volts x amps = watts). I can manually apply a variable load, the tester displays the resultant load current in amps and the voltage level at the battery. On my 1300R I got "about" 9 [email protected] The voltage levels run up and down a little as you try it multiple times but I'd say you are looking at an average around 9A x 13.0V = 117W. I prefer to not be at 12.5V for hours on end on a trip because at this level the battery is not being brought to full charge. I don't want to be riding in the yellow, I'd rather see "at least" 13V, something above the usual 12.8V a fully charged battery at rest should have. The equipment in the OP post uses it's own 40 amp fuse. This tells me it will probably run around 30+ amps, 30 amps x 13V = 390 watts. +-360W potential to the speakers and maybe around 70W to run itself with a very good 80% efficiency rating. The numbers are unknown exactly but they will be close. It is impossible to run at this level on the X. The bike has 120W in reserve and the system wants around 400W. The bike voltage would be very low, high power speakers require a minimum amount of power to sound good, you should never run electronics at a brownout level as it generates excess heat, the bike battery will be draining instead of charging. IMO, better to match the equipment to the bike's capacity. Maybe 2 x 30-40W speakers that will require about 100-120W to run the audio system. Great info, I didnt even think about the charging system. In that case OP could just wire 1 speaker to channel 1 and 1 speaker to channel 2 with the 60w x 4 @ 4ohm rating and be around 120w total. Also there are lithium batteries that can help to upgrade the electrical system. Do they make high output stators for the X? Most car audio guys use high output alternators to keep up with electrical demand. There are several past threads that addressed potentially increasing power through modifying the stator. I don’t remember reading anything that provided an appreciable change. If you can’t up the supply then the next choice is lower the demand. I replaced all lights with LED to decrease the required power to run the system. To monitor my power level I installed a power meter that uses a single multicolored led. Green is great, yellow is caution, and red means you better makes some changes. If I’m jamming to tunes while riding in stop and go traffic, I will see the light move between green and yellow as the cooling fan kicks on. At that point I know it is time to make a change and turn the stereo down thus reducing the power being demanded. For several years this simple yet effective process has served me well. I’ve never been stuck somewhere with a dead bike battery. My amp setup is an Alpine 445 that is 4x45 Watts. The Jensen radio I have doesn’t pull a continuous power for memory to slowly drain the battery which helps. Between the led turn signals, brake light and headlight I have reduced power demand by about 40 watts total which also considers 20 watts for driving lights. The power relay for everything in the fairing is cut off when the starter button is pushed to provide the most possible power for starting the bike. So is the suggestion to go back to a non-bridged setup? Also it install a system volt meter to monitgor the voltage levels so I can make sure I am adequately charging the system? Go to first new post Marvels Miracle Oil?